We recommend that those of you who have not yet updated to the Windows 10 operating system do so right away. The experience you’ll have is better than Windows 7 or Windows 8. Although it is a great OS, it still arrives with numerous problems that people need to fix. One of the latest problems people are having is trying to work out what to do if you cannot save files in OneDrive. That’s obviously a huge issue since people rely on saving files to OneDrive for work related tasks, among other things. While OneDrive isn’t directly attached to Windows 10, the problem of not being able to save files in OneDrive is. For all of you with Windows 10 and cannot save files in OneDrive, here is the fix for you. Type the following code into the Run box: ‘%userprofile%’. Press the Enter key to confirm that command. Allow access if it prompts you to allow access. Continue to the next step if you get no prompt. Right-click the mouse over the Windows 10 Start button. Select the ‘Command Prompt (Admin)’. Now you need to type some command prompts in the command line. Type the command: ‘cd %userprofile%’ without the quotation marks and hit Enter. Type the next command: ‘cd OneDrive’ and press Enter. 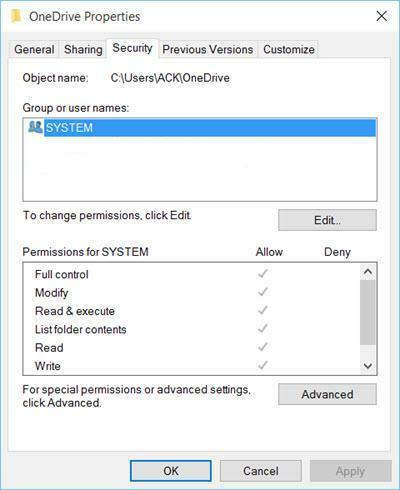 Type the last command: ‘icacls %userprofile%\OneDrive /inheritance:e’ and hit Enter. Now click the ‘Edit’ button and change the permissions if required. The goal here is to check if the system owners settings and permissions are correct.